Benefon today unveiled Benefon Q, a new milestone mobile phone, at the GSM World Congress in Cannes. 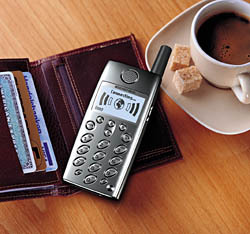 Benefon Q is a true personal communication center, powered by Microsoft ® Mobile Explorer™. Benefon Q is perfectly designed, and one of the smallest GSM phones ever made. Benefon Q will support both WML (WAP) and HTML content and services, giving far more flexibility than today's current WAP-only handsets. Furthermore, Benefon Q has an integral e-mail client, enabling access to regular e-mail services through standard Internet e-mail protocols. Benefon Q's easy access to Internet services and strong design are supported by features like dual-band operation, 14.4 kbps data and fax, predictive T9™ text input, personal organiser and vibrating alert. And weighing only 89 grams, Benefon Q is probably the smallest WAP phone in the world. Benefon Q incorporates Microsoft ® Mobile Explorer™, including a dual-mode, operating-system independent microbrowser. Microsoft Mobile Explorer is a comprehensive, open software platform designed to power a broad range of Internet-enabled mobile telephones. For further information on Microsoft Mobile Explorer, please see www.microsoft.com/wireless. "Benefon Q is an important milestone in Benefon's mission of providing innovative, high-performance wireless communication instruments with professional quality and new Finnish design", said Jorma U. Nieminen, president of Benefon. "Benefon shares Microsoft's vision of the mobile Internet, based on industry standards like HTML and WAP. We believe this standards-based approach benefits end users as well as the developers." The dual-mode WAP and HTML browser of Benefon Q provides the user with a capability to access a wealth of existing services and information, because the browser can automatically read content in either format at a given URL. Also it gives service developers flexibility in choosing their platform, and the comfort of being able to use their current Internet tools and knowledge to design services. The e-mail client in Benefon Q gives the user easy access to standard private and corporate Internet e-mail services, independent of WAP portals, thus further increasing the flexibility of using the product. "Benefon Q is a premium handset, with market-leading quality and features. It provides an excellent personal device for use with Microsoft's end-to-end server solutions for mobile access to corporate and personal information", said Kevin Dallas, group product manager of the Mobile Devices Division at Microsoft. "Microsoft's commitment to industry standards and inter-operability make Benefon Q a solid terminal platform for both WAP and HTML content and services." Benefon Q is the first WAP phone enabling location-based services through support of the Smart Location Server by Hewlett-Packard. "Benefon Q is an ideal device to access mobile e-services. The built-in e-mail client makes it easier than ever before to access solutions like our own OpenMail Anywhere messaging solution. WAP combined with support for location-based services makes the Q a very exciting new product for the developer community in HP's Mobile E-Services Bazaar to work on. The best thing is that it will be very easy for developers to find their way to our bazaar, both online and the physical sites, using the Q", said Bazaar Director Peter Vesterbacka of Hewlett-Packard. More information can be found at www.mobile-bazaar.com. Targeted at mobile professionals, contemporary nomads and anyone appreciating performance, quality and individual design, Benefon Q will be available in production quantities in the summer. Developer support for Benefon Q will be provided prior to general availability. Starting from February 2nd, Benefon Q will also be displayed at FIND exhibitions taking place in the nine European Cities of Culture of the year 2000: Avignon (France), Bergen (Norway), Bologna (Italy), Brussels (Belgium), Helsinki (Finland), Krakow (Poland), Prague (Czech Republic), Reykjavik (Iceland) and Santiago de Compostela (Spain).